ON the host there is a tiny popup bug and a request. ID: has the details on the line below it (this is a created MSI installer). Are we able to have the server its connecting it? we use a private server, and would like confirmation of the server and the status of the connection (unless its done via the icon inthe tray such as the color). Actually, the ID connection status is indicated by a small blue dot on the Host icon. If the dot is, well, blue it means the connection is live and well. A grey dot means the Host cannot connect to an intermediary server (whatever is set - public or private, in the Settings). But if you just need information about the server on that tooltip as well, I think it might possible to add. I will send this suggestion over to our development. I did wonder if the ICON in the tray would define this, however something in the POPUP about the location of the server (cloud / name.com) would be good. The reason for the image was, the ID itself is below the word ID: shouldn't it be on the same line? The tooltip, however, has a limit of 127 characters. We will devise something different perhaps - an info window/popup with more detailed information about the status, addresses etc. Perhaps a glitch. I forwarded this to our development anyway. Thanks. 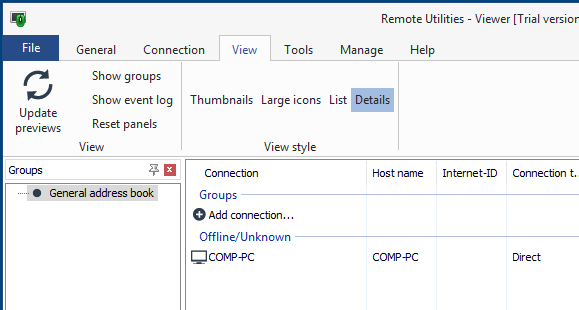 When highlighting a computer inside the address book, is it correct or unimplemented that the tooltip displaying 'host' is blank? I am having a hard time deciphering which computers are what since I have actually renamed the computer network name and need to update the address book. I know I can open the machine inventory but the tooltip would be so much easier. We'll check it out . Thanks for reporting! Regarding this tooltip. We are going to remove it altogether in the upcoming update, because the tooltip is redundant. Now the Details view in the Viewer has all the necessary columns including HostName. Perfect.. one quirk I just noticed, seems that all my computers added are missing hostname field. We'll check it out. You have the most recent version of Viewer and Host installed, right? It's 6.5.0.8. On my system, it seems the hostname is picked up from the direct connections field under the properties of each individual connection. To test, right click on any connection, choose properties, click the radio button for direct connections, then enter the details of direct connection. If using internet id, click that radio button again before closing properties. Hostname should now show what you entered for direct connections.